With 300 Horses under the hood ready to buck, the Nissan Titan is worthy of its powerful name. Once combined with a lift kit and larger tires, that power needs to be properly regulated to eliminate axle wrap. In 2011 & up model Titans, axle wrap can force the drive shaft upwards and actually make contact with the body of the truck. 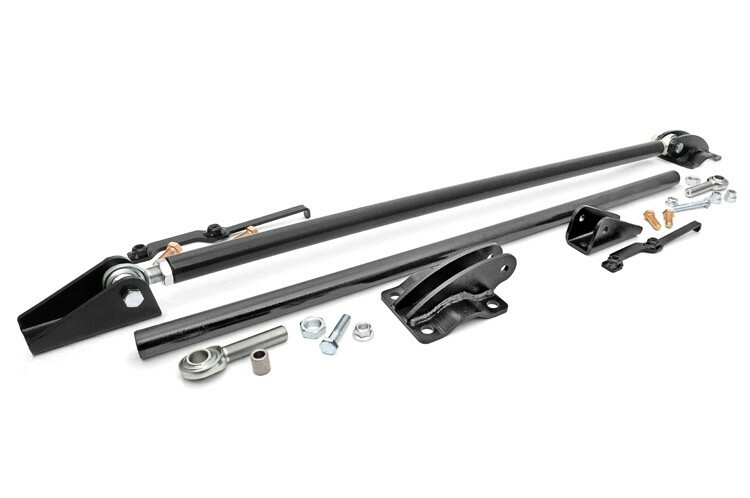 Thanks to Rough Country's new Nissan Titan Traction Bar Kit, you can prevent the axle from twisting backwards, eliminating leaf spring windup and keeping the rear drive wheels forced down to the pavement for superior traction. Eliminates leaf spring windup and rear axle rotation. Creates better rear wheel traction. Built from heavy duty 1.25in DOM tubing and 1/4in plate steel mounting brackets. Includes adjustable Heim joints for a precise fit. Highy recommended on '11-'12 models to prevent axle wrap forcing the drive shaft upwards and making contact with the body of the truck.